Looking across the Kiskatinaw Bridge, Old Alaska Highway. 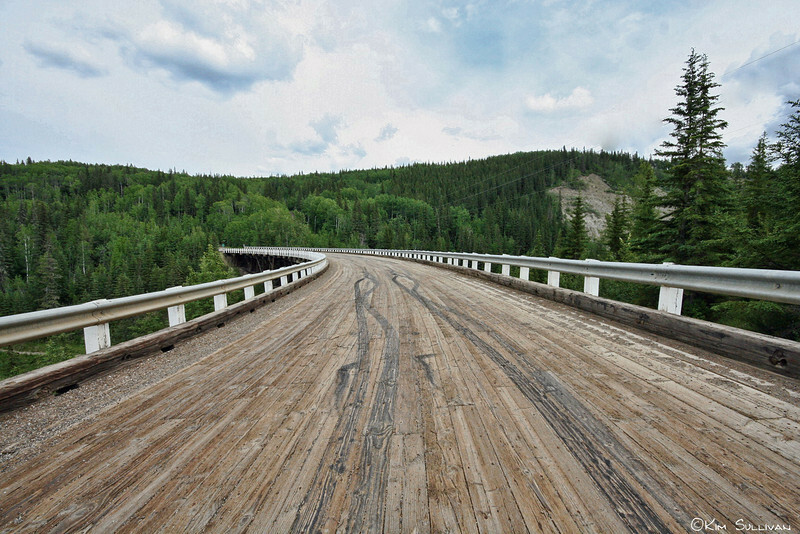 Built in 1942-43 (as part of the Alaska Highway construction) by the US Army Corp of Engineers, this bridge is the last wooden bridge still in use that was built by the Corp, and was the first of it's kind in Canada. It is constructed completely of timber except for cement footings, and curves 9 degrees over it's 534 foot length. Today the highway has been straightened and the bridge replaced, but one can follow signs off the official highway back to the "Old Alaska Highway" and drive over the bridge. The is a provincial park along the river under the bridge with camping and picnic facilities.